After a crazy off-season of frenetic wheeling and dealing, controversies and silly hype, the Eagles season begins, for real, on Monday night during Prime Time. The final preparations are done. The Eagles lost their fourth preseason game, the most pointless, which strangely reassured some people who love to tell you preseason games don’t matter. Which is sort of true, except that some teams execute well and some don’t. Executing well is always better. And the Eagles executed on offense at a very high level. Preseason Game 4 also featured the Eagles debut of Kiko Alonso and the return of Josh Huff, in a game where starters generally don’t play. (My game notes are here.) Huff was targeted only once, on the second play of the game. He was open on a go route but Matt Barkley, who started, underthrew him drastically, leading to an interception. Even so, Huff made a smart play, running down the DB and stripping the ball out as he tackled him. The fumble didn’t count because of bad officiating — an official whistled the play dead when it clearly wasn’t — but a whistle is a whistle, so New York kept the ball. Still, smart heads up play. Alonso played only the first series in his first game action since 2013. (He tore his ACL in the preseason last year.) He looked great, with two solo tackles in just eight plays, and was around the ball on a few others. His motor and instincts are amazing. 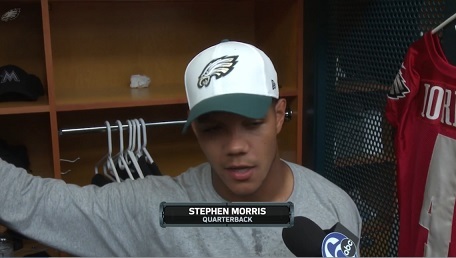 It should be very fun to watch him fill in the final gap in the Eagles Front 7 this year. 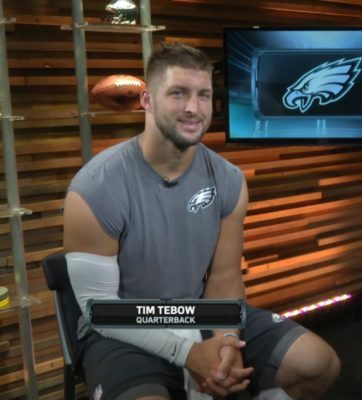 The biggest media story was the competition for the third quarterback position between Barkley and Tim Tebow (a world-class publicity magnet). If you think about it, that’s ridiculous. Third string quarterback? Who cares? The sad truth is that neither quarterback is very good, and it showed. Tebow has deep problems with his throwing mechanics, though he has improved with coaching from trainer Tom House. He’s still bad, on top of problems reading the defense and making decisions under pressure. He does run pretty well, and he’s stout enough to take a couple of tackles, but Chip Kelly tried him on two 2-point conversion plays this preseason and both failed. Barkley, on the other hand, showed the same weak arm he’s had since Philadelphia drafted him two years ago, and the same talent for getting intercepted. He also can’t run and has problems reading defenses, too. Barkley injured his shoulder his senior year at USC, perhaps a repetitive motion injury from throwing touchdowns against Oregon in 2012 (when his Trojans lost 52-61). Game 4 was their showdown, Teebs and Barks getting two quarters each, and surprisingly Tebow was much better — finding receivers even on the run, throwing some nice balls and even scoring a touchdown. After the game, Barkley — who had clearly stunk up the joint — mumbled something about being evaluated on the whole preseason, not just one game. Chip did exactly that — and cut both of them. Instead, he signed Stephen Morris, a very raw and little-known QB from Miami, who was on the Jaguars’ practice squad last year. He’s 23 years old, 6-foot-2, 215 lbs. He started strong in college but had a disappointing senior year after the Hurricanes changed offensive coordinators. He is clearly a developmental project, since the Jaguars — the worst offense in the NFL — cut him. But he has a big arm, decent size, and some speed (4.63 in the 40). Tebow is also a developmental project, but his upside is questionable, since he’s not young and has been trying to improve for so long. Barkley is ceilinged out at “pretty bad” and shows no sign of growth potential. In other roster decisions, inside linebacker Najee Goode got cut, which was a surprise. He was not only good in camp but played well in actual NFL regular season games when Demeco Ryans got injured. The team is stacked at ILB, though, drafting Jordan Hicks in the third round this year. Kenjon Barner made the team, which was not a surprise after two punt-return TDs and 50-yard reception on a screen pass. Brandon Bair and Taylor Hart made the roster at backup defensive end, but Jeff Maehl‘s two-year run with the team ended. I suppose that’s true, though the team has a detailed and interesting strategy to handle injuries, which I discussed at length on a podcast. Several pundits have picked the team to go deep into the playoffs this year – to the NFC championship game or even the Super Bowl. Of course, Chip would say that every game is the Super Bowl, so let’s worry about the Atlanta Falcons on Monday night. They have a very good offense (Matt Ryan, Julio Jones) and not much defense. It should be a good test of how solid the Eagles’ totally revised secondary is. If they can slow down the Falcons at all, it should be easy for the Birds to win a shootout. If they can’t, all of Chip’s hard work over the summer won’t do much to improve this team’s record.